Discussion in 'Sculpture and Makeup Effects' started by Ketzer.com, Apr 11, 2006. 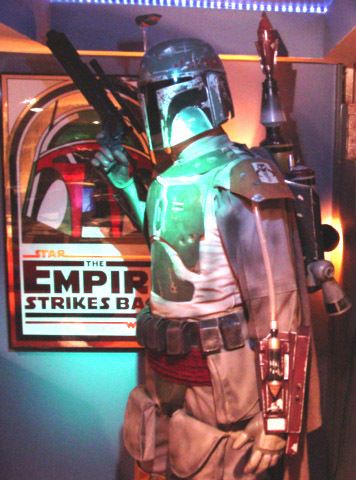 I saw this Boba Fett statue on ebay sell for 9000 bucks. And I was quite surprised by that price. Is that "normal".? Anybody know the reason for these variations? Hmmm, that helmet looks undersized in the ebay post or I could be mistaken. In any event, for about a third of that cost ($9000) you could put together a Fett costume that would make that one look silly. None of this stuff is worth anything; except what someone is willing to pay. I am aware that this is not the greatest Fett out there. Um, didn't the DP life-size stuff drop off after the first 100 or so? Due to production costs and people not lapping them up? From what I can remember. 9grand seems way high....I remember these having trouble fetching retail price in the secondary market...GREAT for the seller though. SOme of the DP statues got some GREAT paintjobs. Like yours did. Others, basically had paint randomly tossed on the statue, and they called it good. You got a good one, apperently. 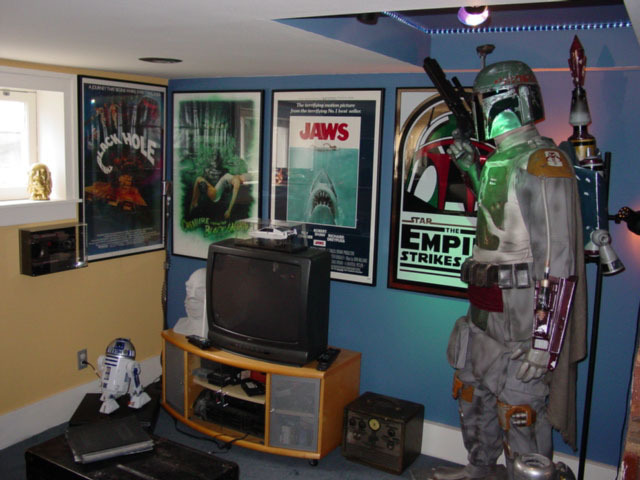 Any ideas on what a DP lifesize Stormtrooper is worth? Ketzer what number do you have and how does it compare to auction ? I agree with DL 44 Blaster. Your Fett statue looks pretty unique. However, the DP Deluxe helmets were very much the same way. Some of the early ones were VERY different in terms of paint and weathering than the later helmets. It makes me think that the first few might have been something of test subjects or at the verye least, minor detials were still being worked out. Not trying to get off subject, but I think it will be really be interesting to see if all the MR Fett helmets are identical or if they will be like the DP Fett stuff that varied quite a bit from piece to piece. While DP may not have been totally accurate, you at least know that your piece is fairly unique. I just wish someone would release a mannequin in that pose so we could put our own Boba/Jango/Stormtrooper armor on it. Yeah 32, if I recall sounds low enough, I think it was after 50 they started to spend less attention to detail and battle damage the helmet/armour with silver paint pens. I have looked around and cant find the article, maybe someone else here know where it is. I bet the one in the auction was one of the last ones to roll out the door. I seem to remember a tutorial on making your own fully poseable mannequin that was posted here a few months ago (I think). It's pretty cheap, too. Mostly PVC pipes and foam rubber. That way, you can put Boba or anyone else in any pose you want. I have Fett # 23. That looks very much like mine. Thanks for posting the pics. You bet. No problem. Like I said I love mine. I can take some more pics if you need any. I was asked quite a few years back to make a mannequin for someone's Boba Fett suit. I based it on the Don Post version. I agree that these are not the most accurate Fetts in the world, but man they are impressive none the less. I've had the pleasure of owning this statue, twice. I currently own one, & it is just cool. I had the honor of visiting Don Post Jr. on many occasion when they had there shop minutes away from where I worked in Burbank. Before Paper Magic bought them out. The first one I purchased was a # 13. It was an Amazing paint job. Not as tattered or "weathered" as the ones pictured, but very nicely done. The armor pieces were weathered very well. I sold that one & purchased another one, # 50 or #70 something or other, I'm to lazy to go check. Anyhow, this one is a bit more clean, but not that far off from the # 13 I originally had. I asked Don about the variance in color schemes & he told me that first off, like so many other numbered replicas in a series, numerical order wasn't necessairly the order they went out of the shop. He told me that they went in batches . Every batch having the same "artist". So when another batch went out more than likely it was painted by someone else, hence lending itself to a different paint job everytime no matter what the standard "template" was. It also depended on the personal like of the customer. some people specifically would ask for a "clean" version. So, go figure, Don actually would listen to a specific request if he got one. Don was an awesome guy to deal with. He took a complete stranger (me) & showed me around his shop. Pretty * cool. He led me to believe that the Fetts that were more weathered were actually the ones that were paid less attention to. it almost looks like they just got an airbrush & blasted the suit with black spots. The first 20 or so were the ones that got the better paint jobs. He told me that some actually had different colored belt ammo pouches. One batch would have the aged weathered brown while others had just plain black. Completed 1:1 V4b YODA Statue.